Paper on Bent Flyvbjerg's "Rationality and Power"
A critical review and comparison with Pressman and Wildavsky's "Implementation"
This review is on a book on planning with the background not in social sciences but in urban planning and geosciences, it therefore is categorized as a major contribution to planning theory rather than to political theory(see Peattie 2001:252). But sure enough, it would not be object of this analysis if its relevance and tenor were not relevant for policy practitioners. And not only them, since the various contents are also of interest to students and academic personnel of administration and politics, anthropology and sociology and constitute furthermore a meaningful laboratory-like supplement to political philosophy courses. The book itself creates new possibilities for an inspired dialogue between researchers and practitioners. Flyvbjerg sets out to show how power creates its own reality, uses rationality to rationalize its decisions, and strategically switches between political and expert discourses as it needs to in order to get what it wants using the Aalborg Project as a metaphor of comprehensive planning. 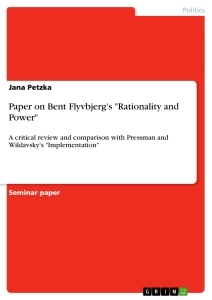 This scientific book review will not only evolve around the pure contents, sense making and theoretical conceptualization of Flyvbjerg’s Rationality and Power, but will include to implicate input and attempt a comparison with Pressman & Wildavsky’s Implementation and writings by Buchanan & Boddy as well as Siebers. When in autumn 1977 the project was initiated by high level city officials, they intended to plan, legitimize and implement a comprehensive city plan within 3 years. The main actors included among others various officials of the Municipality’s Technical Department and the City Council, the Aalborg Chamber of Commerce and Industry, the newspaper Aalborg Stifstidende and the Aalborg Police Department. The formed Task Force and Executive Committee had set their goals to planning involving and accounting to urban renewal, land use, environment and traffic with the aim to reduce car traffic in the historical city center. The sub-projects included a 4-zone division of downtown for motorists, “bus only” streets, a bus terminal, bike paths and pedestrian areas. With the city bus terminal being the largest subproject the struggle about location and size resulted in the decision of splitting the implementation and a prolonging due to a phase of public exhibition. The following rejection by he Chamber of Commerce and Industry and the negative press coverage resuscitated the long lasting informal relationship and tradition of the Technical Department’s alderman and the Chamber of Commerce and Industry to pre-approve policy proposals before the democratically elected City Council ratifies proposals. In a power struggle of concessions, revenue surveys including open confrontations the project got torn apart, with modifications and missing consequences from once planned parts that led to traffic, pollution and accident’s increase. In 1983 the City Council ratified the 11th version of the Aalborg Project; it contained incoherent subprojects which may not be implemented for another 2 years. In the years following the ratification the “founder” of the project retired one by one and despite the try to revitalize it by an alderwoman the project went into a stalemate. In 1991-94, after two years of inactivity elements of and lessons from the Aalborg project were integrated into a new round of comprehensive planning for downtown Aalborg, though the case study ends its analysis of rationality and power in 1990. After discovering what Flyvbjerg tells his readers, his means of presentation will be subject to this part of the review. The author decides to conduct a dense data case study and thus gathers information from seven types of data sources including historical documents, interviews, informants, observation, participant-observation and 35 semi-structured in-depth interviews (see Flyvbjerg 1998:250). Methodologically imbued by the Wittgensteinian approach to narratology he decided to present the empirical case interwoven in the analysis of his conceptualization of power and rationality, which will be analyzed beneath. He adds parts of interview scripts throughout the whole book and is deliberately descriptive providing detailed specifications of developments although being oddly short on dates of any kind for a chronological narrative. This approach of interweaving analysis and empirical narrative diverges greatly from the diagrammatic example put forward by Pressman et al. in the presentation of the Oakland Project. In their approach the case is firstly summarized and then analysis under set categories and concepts and is summarized in such a way as to make comparison possible and to further relate these characteristics causally to outcomes also rendered by uniform indicators (see Peattie 2001:259). With aphorisms of Nietzsche, Machiavelli, Bacon and Foucault Flyvbjerg relates the case itself to the concept of power and rationality and consciously combines the roles of narrator and academic to produce a work that reads like a novel, but comes to the conclusions of an academic political scientist or sociologist. The main point of Flyvbjerg seems to be the demonstration of power relations and the analysis of the change of rationality. He therefore sets out to present human behavior and reactions of actors with and without power. Furthermore, he chooses to only circumstantially describe those actors most relevant to his power relations, leaving out other actors to be described in a similar manner. This can be seen in the in-depth elaboration of the informal meetings between the Municipality’s Technical Department’s alderman and the highest representatives of the Chamber of Commerce and Industry and the internal disputes the parties go through independently. This seemingly main focus must have appeared to Flyvbjerg to be the one most plausible to finally reach the generalizations at the end of his book appears striking when considering the authors inattention to the importance of developing a more direct and sustained comparative analysis of human relations. This analysis of human relations, which one may understand to be the ways in which people deal with one another in the ongoing constitution and implementation of policy does after all come short. Unfortunately, Flyvbjerg does not engage these matters on a more explicit, conceptual plan, which might be choice or carelessness. It certainly leads to the omission of analysis of actors that do not fit to Flyvbjerg’s extreme categories of power and rationality, like the Danish Cyclist Federation and the Kayerød Neighborhood Association, which are presented as actors but are flawlessly analyzed under the categories Flyvbjerg tries to establish and generalizes upon. Interesting after all is that Flvybjerg himself gives no determination whether the project was a failure or a success, but he concludes from his evidence, that “Aalborg’s overall situation would have been better had the Aalborg Project not been implemented at all.” (Ibid.) The book therefore does not praise the plan, but neither does it blame it; the story is one of ineffectiveness. Before elaborating on analysis one has to shortly stop and think about the definition of terms and by doing so determine which phase of policy cycle this book contributes to. Policy formulation, program establishment or implementation are familiar terms after having studied Pressman & Wildavsky’s Implementation, but planning is now an accrued term to be fit into the policy cycle. Flyvbjerg offers us his definition as an understanding of policy being more or less a linear one when he talks about the entire life of the project “from genesis and design to approval, implementation, and operation” (Flyvbjerg 1998:27). Identifying the policy in this case with administrative city officials deciding that there has to be something done about land use, environment, traffic and urban renewal and the implementation than be the construction of the road outlay and bus terminals, bike paths and thereof more, we can determine the planning being the program in between, being the development of a traffic and city center plan. If the latter are agreed upon than this book is about the program and for the major parts only about the program. Flyvbjerg uses four concepts to make sense of the data and his research and decides to present his findings under firstly a conflict centered approach with a power-as-strategies-and-tactics view of power, secondly the rationality and power issues that he mirrors the behavior and actions against and the ten propositions as a concept interwoven with the analysis thirdly and fourthly the concept he himself calls Realrationalität. All four will be elaborated in the following paragraph. The conflict centered approach with the power-as-strategies-and-tactics view of power inducts from the later presented concept of “real rationality” and was chosen by Flyvbjerg to demonstrate “the dynamics of conflict and struggle”. He argues that the social conflicts and their suppressing as well as the ignorance to conflict and power place the conflict at the very center of power and so he decides to place them at the center of his analysis (see Flyvbjerg 1998:6f.). The second concept reveals itself early on in the title. The work at hand is presented as a study of Rationality and Power. To these, presumably contrasting, categories to action are added a third term, ‘democracy’, via the subtitle Democracy in Practice. All three of them are used to make sense of behaviors and to lead the reader towards the twentieth chapter where generalizations, or rather theory, about all three categories are offered. Flyvbjerg ends up with a theory of power that reduces his analysis to mere claims e.g. ; "power defines reality," "rationality is context dependent," "rationalization presented as rationality is a principal strategy in the exercise of power," and "the greater the power, the less the rationality"(Flyvbjerg 1998:257-234). Thus, he relinquishes his focus on providing an analysis of people's enacted strategies and tactics entailed in policy formation.The propositions on power relation and the variables rationality, weakness and knowledge are ones more summed up to stand at the end of the book as almost a glossary to return to. The conceptualization of power as the power to define reality, or as the power to impose interpretations on the others will finally lead also to a conclusion on democracy at the mercy of power. For relation of democracy to the aforementioned see Flyvbjerg: 1998:234f. Unternehmen zwischen Moral und Rentabilität. Welche Möglichkeiten der Implementation bestehen und was ist dabei zu beachten? Welche Probleme gibt es für Deutschland bei der Implementation der europäischen Umweltpolitik?